Vietnam veteran and Bay Shore native Frank Romeo is getting set to walk 750 miles across all of New York State — while documenting his efforts. The journey is designed to bring awareness to post-traumatic stress disorder, suicides and the effects of other debilitating mental issues impacting veterans from across the U.S.
And, it will promote Romeo’s paradigm-shifting approach to teaching to high school students about war, which is already happening in Bay Shore. To kick things off, a fundraiser to support Romeo’s efforts is being held Feb. 17 at the YMCA Boulton Center for the Performing Arts in Bay Shore. One day, at the apex of the Vietnam War, a teenager from Bay Shore found himself dropped into Cambodia on a covert mission. When he got separated from his unit on the Ho Chi Min Trail, he was suddenly surrounded by Viet Cong. He was experiencing a soldier’s worst fear. Alone, far from home and facing almost certain death, this was a reality they did not teach in school when 18-year-old Frank Romeo volunteered for the U.S. Army with his buddies. What ensued would alternately haunt him and inspire a decades-long mission. That day Romeo was shot seven times. Aside from the physical wounds, Romeo, now 70, suffered from what today we know as post-traumatic stress disorder, or PTSD. But they didn’t yet have a label or an understanding for his condition. Little attention was given to the plight of soldiers returning from war, as there is today. Like in Cambodia, he was left alone upon returning to Bay Shore, left to grapple daily with the effects of what he had experienced. It took two decades, but eventually Romeo was able to come to terms with his suffering. He found solace in painting. Although his themes were always about trauma and war, it was cathartic to express himself through art. He isn’t shy about talking his PTSD. Romeo, who is married with children and still lives in Bay Shore, says he was diagnosed with 100 percent PTSD-related disabilities. He calls it a “socially-crippling disease” and is still under treatment at the VA Hospital in Northport. He takes medication for the disorder. Though the years, Romeo began to suspect he wasn’t alone. He eventually began to search out other veterans with similar backgrounds and similar interest in exploring their experiences through art. He collected their art and travelled around the country exhibiting it, sleeping in his van surrounded by the work. Then something clicked. He realized he was documenting American history through art. It hasn’t always been easy. Romeo encountered resistance along the way while trying to educate people about this particular mental health issue. “There was a stigma attached to Vietnam veterans and a stigma of me being 100 percent PTSD,” he said. “Schools were leery of me coming in to talk to their children. Since then, Romeo’s mission grew and he crossed paths with others who believed in what he was doing. One of those people was Susan Barbash, also a Bay Shore High School graduate. As chairwoman of the Bay Shore Schools Arts Education Fund, Barbash was inspired to help promote Romeo’s work. More than that, she saw his vision for what it was. Romeo was looking to do more with his message. She soon introduced Romeo to the social studies department of the Bay Shore School District. The director of social studies at Bay Shore Schools, Joseph Lemke, along with other teachers in the department spent several months creating a unit within the U.S. History and Government curriculum to go along with Romeo’s “Art of War” program. “We wrote our own mini-unit that is taught over several lessons in support of Frank’s exhibit,” said Dr. Lemke. The unit was shared by Dr. Lemke with colleagues in other districts so other schools can integrate the same lessons into their U.S. history classes. The Social Studies program was piloted in Bay Shore School District this year. It’s a different world today, says Romeo, and the way we look at war needs to change as well. Romeo says he advocates for veterans past, present and future — those who haven’t joined the military or seen war yet, but will experience it. Through his program, he hopes young people will get a lesson in war he never received as a young man joining the U.S. Army. To help bring awareness and spread the program to classrooms across New York State, Romeo is going to walk from Buffalo to Bay Shore. The idea is for the local school districts to all take notice of his efforts. He’ll be visiting VA centers, living in homeless shelters, and talking to veterans. Romeo is documenting his journey in a blog and on film with an Emmy-award winning documentary crew following him across the state. Bay Shore Superintendent Joseph Bond has already helped in the efforts. Bond has reached out to districts across the state that have now invited Romeo to come talk about the curriculum in their schools when he passes through. Romeo starts his 750-mile walk on March 1, from a VA hospital in Buffalo. 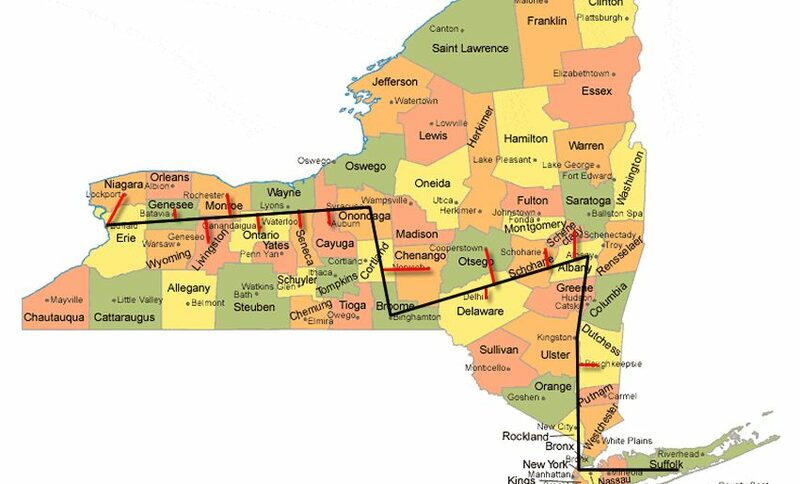 For the following three months he will take a zig-zagging route through Syracuse, Binghamton, Albany and New York City. Click here to see the full route. He’s calling the endeavor “Walk with Frank,” also a metaphor for Romeo’s harsh, lifelong journey of dealing with PTSD. His walk will end in Bay Shore sometime in June. Highlights include a stop in Albany, where legislators will join Bay Shore School District administrators and students to talk about the program in a virtual site session. His plan is to enter Manhattan during Fleet Week. Everything Romeo does is meant to ground the experience of soldiers in reality. He says he sees a disconnect between the younger generation’s understanding of the idea of war and the actual reality of war. He says that as a country, we owe it to future soldiers to be transparent and give them all the tools necessary to make informed decisions about the military. Barbash said Romeo is not for or against war itself; he’s pro-soldier. On Sunday, Feb. 17, from 4 to 6:30 p.m., the kickoff event at the YMCA Boulton Center for the Performing Arts in Bay Shore will raise money for the Walk with Frank. The day will include plenty of entertainment, and Romeo will talk about what he’s about to do. Tickets start at $25 for general admission. Access to a pre-event cocktail party will be available for a $100 donation. Romeo says he’s happy that more people are starting to talk about PTSD. “A part of the military background is that you can’t go into battle feeling vulnerable,” he said. “You have to go in feeling invincible. That’s the only way to survive combat. He also feels like he’s finally being heard. Click here or call (631) 487-6488, for any more details about the fundraiser in Bay Shore, or email info@walkwithfrank.org.